Result: Children below 5 years of old acquired preschool training and enabled the parents to earn their livelihood. Area of operation: Thalapathisamuthram, Elangulam and Kallathi villages of Tirunelveli District. District. 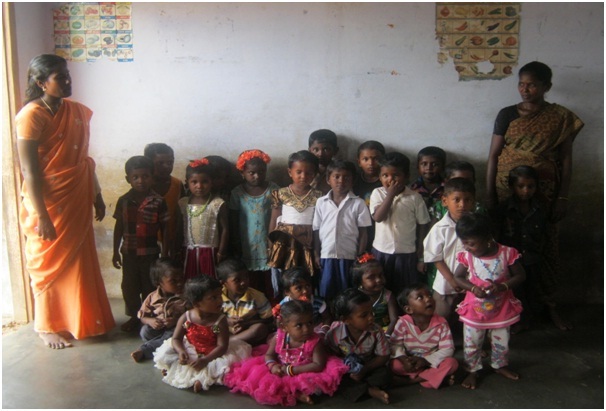 RUC is running four Creches in Thalapathisamuthram (2-units), Elangulam and Kallathi villages of Nanguneri Taluk, Tirunelveli District having 100 students. They are getting preschool training, nutritious mid day meals and health care support. Children are facilitated to increase their motor development, knowledge development, social development, physical development, and language development through play way method. Good habits and mutual love are inculcated on the children. The elder ones are relieved from caring of the younger brother/sister by leaving the school and enabled to continue the schooling without break. The beedi rolling women and agricultural labourers are relieved from the task of child care during the daytime and are able to earn for the livelihood of the family.